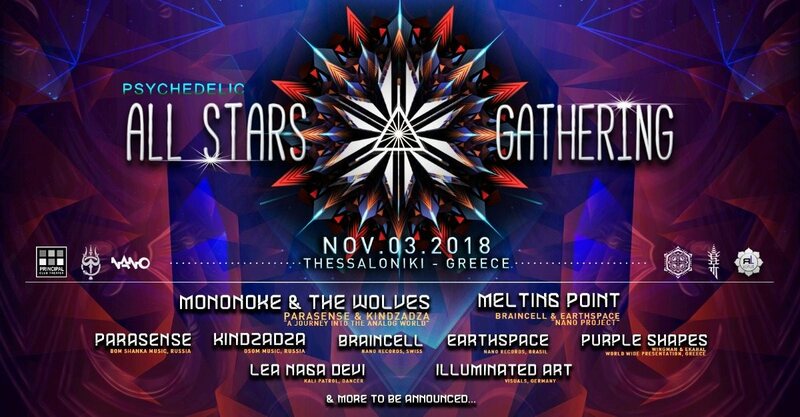 Inner Mind Productions, Rising Lotus Productions and Fanis Wingman Ntompros aka Wingman are bringing to Thessaloníki the event called Psychedelic All Stars Gathering! This moving project had chosen Thessaloniki because of his high taste and excitement for psychedelics events/festivals and because everyone knows that Greeks are Big Ravers! And we Love Raving! Because of all that, we are coming to open our Portal and welcome you in it with some talented Visionaries/Artists! Kindzadza & Parasense live on stage - 100% analog music! A concept that embraces, gods & goddesses, a sci-fi world, hell & heaven, looks interesting no? what we can share, is, a new Visual performance & experience will come out of this one!